Bequevé Inn offers you an ALL INCLUSIVE PLAN. The accent at Bequevé is on providing a simple yet pleasant and comfortable setting with handsome rooms including private baths and ceiling fans; first class attention and superb meals. We guarantee your comfort by disposing autonomous public utilities ( fresh desalinized water, electrical power, ice machine). Our instalations are located on the Church street, close to the Gran Roque beach coast. (There are no paved roads in Los Roques, its all sand). Posada Mediterraneo, located in at the Gran Roque Island, offered you a personalized service tailored to your needs, in a cozy 0environment, whit a first class service, exquisite food, which mixes Italian quality with Caribbean flavor. Six romantic rooms, Mediterranean style living room, a wonderful terrace, service to and from the neighboring islands in privet boat, chairs and a gazebo on the beach. 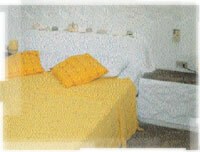 Six comfortable rooms with air conditioned, roof fan, privet bath and security box. Mediterranean style lobby. Exquisite food from our own kitchen. Dinning room, porch and terrace.Library. Private boat. Ice maker. We guaranty a standard of comfort with a 5.000 Lts water reservoir of drinking water, an emergency electric plant and a privet desalinization plant.We speak French, English and Italian. Room service.